Sense Technologies, Inc. manufactures Guardian Alert, a backup collision warning system (US$379 suggested retail price). 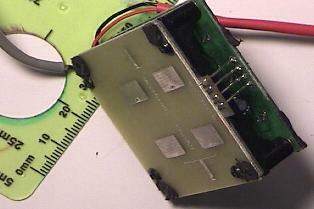 The detector is a two inch square, 10.5 GHz radar module fashioned into a plastic license plate frame (Fig. 1). The detector is wired to the white backup lights, powering it when the vehicle is in reverse, as well as to a small speaker and LED module placed near the driver. When backing up, different audio tones warn of objects within one of three radii (Fig. 2). The device is OEMed; Microwave Solutions Ltd designed and manufactures the microwave radar unit that forms the core of the design. Figure 1. The Guardian Alert backup warning system mounted on a license plate frame, with stylized radar waves. Figure 2. The Guardian Alert's detection pattern. Removing the plastic license plate frame reveals the radar module (Figs. 3 and 4). It measures 5x5x1½ cm, and is a marvel of neat, clean microwave design. Because it's so modular, it's well suited for study and experimentation. Let's explore this clever design in more detail. Figure 3. Guardian Alert radar module, front view, showing microstrip patch antennas. Figure 4. 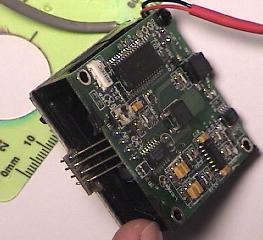 Guardian Alert radar module, rear view, showing low frequency processor board. Disassembling the radar module (Fig. 5) reveals its four components: the antenna board (1), the high-frequency microwave board (2), an inert plastic frame (3), and the low-frequency processor board (4). 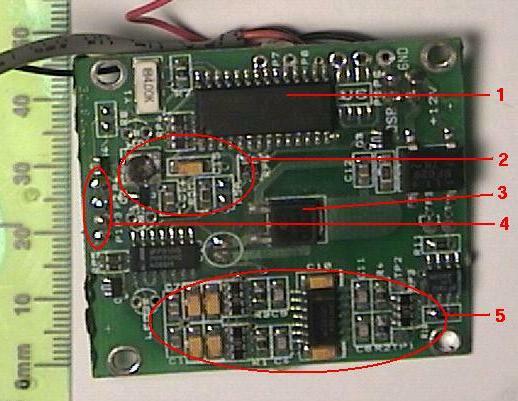 Power supply lines and the cable to the driver warning module are seen to the right, soldered to the processor board. The only electrical connections between the boards themselves are the four wires (power, ground, VCO frequency control, and beat signal) between the processor board and the microwave board, visible cut in Fig. 5 and intact in Figs. 3 and 4. The antenna board is coupled to the microwave board with a slit coupling described below. A block diagram of the radar is shown in Fig. 6. Figure 5. Disassembled radar module. Figure 6. Block diagram of radar module. The most complex component is the microwave board (Fig. 7), which uses a 10.5 GHz voltage controlled dielectric resonance oscillator (VCO-DRO) to generate the microwave signal. A DRO's resonant element is a puck of dielectric ceramic, coupled to the oscillator by its physical proximity to coupling pads. A VCO's frequency can be skewed by varying a control voltage, and in a VCO-DRO this is done by varying the voltage on a coupling pad. Active gain is provided by a microwave field effect transistor (FET). High-frequency signal flow is roughly top-to-bottom in the picture, and there are no hidden traces; this is a single layer PC board. Visible are the oscillator's +5V power supply line (1), the frequency control line (2), the high speed FET (3), the dielectric puck (4), the VCO coupling pad (5), the splitter (6), the transmit antenna coupling (7), the receive antenna coupling (8), the receive mixer (9), and the beat signal's low-pass filter (10) and return line. Ground shields are distinguishable by the small, plated-through holes that connect them to the ground plane on the rear of the board. Notice that there are no switching elements in the transmit signal path; this is a continuous wave (CW) radar. The four wires to the processing board connect at the bottom of this picture. I explore the microwave design issues more in Guardian Alert - Part 2. Figure 7. Microwave board, top view. 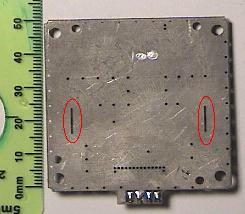 The antenna board is coupled via slots, shown circled, in the microwave board's ground plane (Fig. 8). The transmit slot is on the right in this view, and the plated-through holes are again visible. Figure 8. 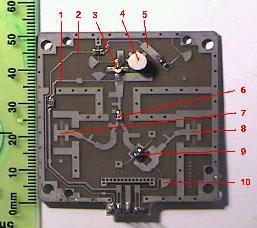 Microwave board, bottom view. The antenna board (Fig. 9) is bare on the side that contacts the microwave board, so the microwave board's ground plane effectively acts as a ground plane for the antenna board as well. 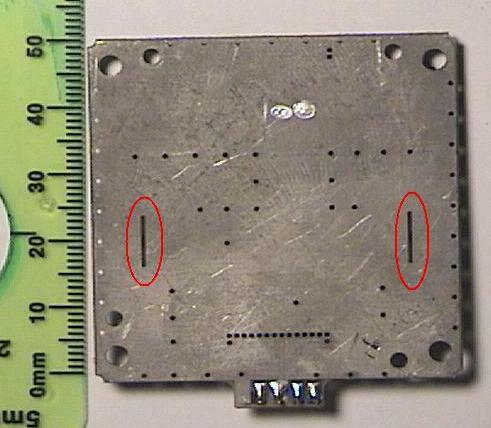 The microwave signal couples from the microstrip lines on the microwave board, through the slots in the (common) ground plane, to the microstrip lines on the antenna board, which connect to the antenna arrays. Each antenna array consists of a pair of patch antennas. The picture is oriented the same as the bottom view of the microwave board (Fig. 8). 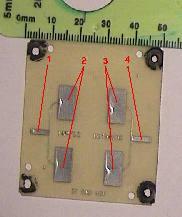 Visible is the recieve coupling (1), the receive antenna array (2), the transmit antenna array (3), and the transmit coupling (4). The radar's "smarts" are contained on its low frequency processor board (Fig. 10). Visible are the microprocessor (1), a Motorola MC68HC705 with custom PROM; the frequency control section (2), which drives the microwave oscillator's VCO line; the +5V regulator (3); the four wires connecting to the microwave board (4); and the receive filter bank (5). The radar module only has to detect doppler shifts, since the vehicle will be in motion and thus even stationary objects will have a net doppler shift. The wavelength of a 10.5 GHz signal is 2.84 cm, so an object moving at 1 m/s (about 2 miles per hour) will cross 35 wavelengths every second, showing a doppler shift of twice that (70 Hz), since the radar beam must cover the distance twice (out and back). Objects moving faster will show doppler shifts of higher frequencies. In short, objects moving between 1 and 25 miles per hour will doppler shift a 10.5 GHz carrier roughly from 20 Hz to 2 kHz. Since the microwave board mixes the receive signal with the unshifted oscillator signal, these doppler shifts will appear as low frequency beat signals going back to the processor board, where conventional op-amp filter sections can detect them. Doppler shifts encode speed information, but it may not be clear how a continuous-wave (i.e, unpulsed) radar can detect distance. This is where the VCO comes into play. By varying the frequency of the microwave carrier, a phase shift can be induced in the doppler return signal (Fig. 11). For example, it's already been noted that a 10.5 GHz carrier has a wavelength of 2.84 cm. However, a 10.55 GHz carrier has a wavelength of only 2.82 cm. An object 1m from the radar is thus a quarter wavelength "farther" at the higher frequency (35.21 vs 35.46 wavelengths), creating a 90° phase shift. In fact, this example is contrived; the phase shift is too large. A smaller frequency variance is used in practice. The Guardian Alert shifts back and forth between two frequencies at several kilohertz, switching the return signal alternately between two nearly identical filters on the processor board. This effectively becomes a sampling problem, and since the sampling rate is significantly higher than the frequency of the signals being detected, we effectively get two radars for the price of one, operating at slightly offset frequencies. The output of both filter banks is available to the microprocessor, which can compare their relative phases and thus infer distance information. A tuning potentiometer (visible in Fig. 10 at the left of ellipse #2) allows the VCO signal level, and thus the frequency offset, to be varied for precise range adjustments. Because of its modular design, the Guardian Alert radar module can be assembled in various configurations, making it ideal for microwave experimentation. Both the processor board and the antenna array can conceivably be replaced; the design of the microwave board is too intricate to modify. Note that the antenna board, though simple in its design, requires tight tolerances in its construction due to the short wavelengths involved, which are made even shorter by the PC board's non-unity dielectric constant. Here are several possible experiments; if you attempt any of these, or others, please email me your results. Replace the processor board with a standard PC and a data capture (A/D converter) card, such as any of those supported by Comedi. Write a software program to mimic the function of the processor board. Output the frequency of the doppler shift and the phase variance between two frequencies. Convert these values into speed and distance estimates. How accurate are they? Can you tell if the target is moving towards you or away from you? 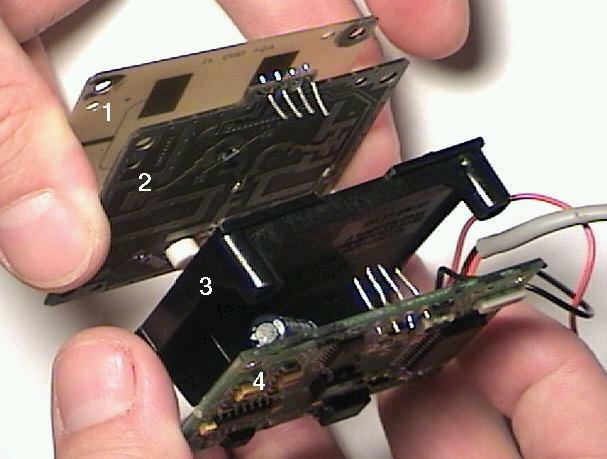 Build an "antenna board" that connects two radar modules (A and B) together, feeding the transmitter of A to the receiver of B. Provide a quarter wavelength stub to shunt off B's transmitter. Observe the beat frequencies produced at B's output. Are they stable over time? Temperature? Study how they change when A's VCO control is varied. Plot A's VCO voltage vs. frequency curve. It is linear? Switch A and B, and plot B's curve. Are they the same? Build a microwave interferometer. If the oscillator's frequency is stable over time, this can be done using two modules, several meters apart, with A's transmitter pointed at B, and B's transmitter shunted. Adjust them to get a suitable beat frequency. Now, moving one of the modules over a measured track, observe the phase change in B's output. How far do you have to move to produce a 360° change? Careful measurement of the distances required to produce given phase changes reveals the exact wavelength. How accurately can you measure the wavelength, and how close is it to 10.5 GHz? Are you measuring A's wavelength, or B's? Design an antenna board using a single antenna array, instead of two. Use a directional coupler, probably a quadrature hybrid, to achieve isolation between the transmit and receive paths. Replace the antenna board with a more highly directional array. See Kraus, Section 16-12 ("Patch or Microstrip Antennas") and the references listed there. Implement an FM radar system by continually varying the VCO control signal, conventionally with a ramp or triangle wave. By the time the radar signal has gone out and returned, the oscillator's frequency should have changed enough to produce a beat frequency, even for stationary targets! Convert the beat frequency into a distance estimate. Use the directional array and FM radar of the last two experiments, as well as the PC data capture design of the first experiment to construct a practical radar system. Directional arrays can be "steered" electronically (using phase shifters), but mechanical beam steering is simpler. Mount the radar module and its directional array on a rotating mount. Modify the FM radar software to show a plan position indicator (PPI), the traditional radar display. How good a radar can you build? Kraus, John D, Antennas, second edition, 1988, McGraw-Hill, ISBN 0070354227. Pozar, David M, Microwave Engineering, second edition, 1997, John Wiley & Sons, ISBN 0471170968. Skolnik, Merrill Ivan (ed), Radar Handbook, second edition, 1989, McGraw-Hill, ISBN 007057913X.